This targeted serum is specially formulated for sensitive and hypersensitive skin to restore its natural balance and to soothe the effects from various stress factors such as environmental aggression and dermatological or cosmetic treatments. 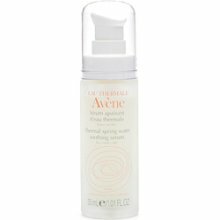 Through its patented liposome delivery system, it captures Avene thermal spring water in tiny reservoirs for maximum efficacy, prolonging its diffusion in the skin for long-lasting benefits. The serum absorbs instantly and provides skin with a pleasant sensation of smoothness and comfort while restoring softness and radiance. Hypoallergenic and noncomedogenic.